The story of Siddhartha is well-known and well-loved, but its origins from the mind of Hermann Hesse owe much to his analyst Carl Jung and his collective unconscious theory of mankind. In this whimsical and poetic adaptation by Eric Hill, Hesse himself tells the story of the young Siddhartha’s journey into manhood and enlightenment as he explores the world and discovers himself. With the help of Jung, Freud and three Hindu Goddesses, Hesse finds parallels between himself and the man who would become a Buddha. 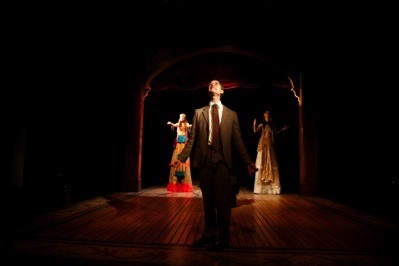 The play opens with Hesse being discovered in the Magic Theater – the place he can experience and live out the fantasies of his mind. The sound of the Magic Theater is a long droning chord on the pipe organ, mimicking the open drone of the Indian instruments to come, and the meditative sound of Om. Hesse introduces the 3 goddesses who will guide him through the story of Siddhartha, each goddess accompanied by the atmosphere and instrumentation associated with their persona. As the story comes to life, the Magic Theater is transformed, the idyllic sounds of Siddharta’s childhood carry Hesse to ancient India. 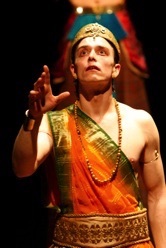 The young Siddhartha and his friend Govinda leave their village to join the ascetics in search of enlightenment. Siddhartha becomes disillusioned and sets out on his own to find nirvana. His journey winds thru the world of love, with the beautiful courtesan Kamala; to the world of business, with the wealthy merchant Kamaswami; and finally, to Vasuveda, a ferryman who has attained enlightenment by listening to and becoming one with the flowing river. Traditional Indian instruments are used to create the atmosphere and define the concepts embodied in the story of Siddhartha. Droning instruments such as the Sitar, Surbahar, Tambura are used to create the mystical, transportive sound of meditation, and accompanies the sound of OM. Percussion instruments – Tabla, Rdung, kanjira, kartal, chimpta are used in Kamala’s procession, and are infused in the sound of the city – the fast lively world of commerce. Melodic instruments – The Santoor, Basri flute, and others are associated with Love, Peace and Tranquility. The sound of the flowing river is the sound of “being” – life, eternity. The sound of the voices, singing in ancient and long-lost languages, is the universality of communication, the link that connects us to the human experience. “About this time I began to have a series of dreams that at first I thought wholly unconnected to the story of Siddhartha. Beware the black mudslide...of occultism! (Music climaxes. There is a flash and a sound like the explosion of a giant light bulb. Ka enters. He is larger than life: his head is wolf-like and ringed by a nebula of stars.